Friday and Saturday nights may be the most common times to explore DC's cocktail scene, but the true booze artists emerge on weekend mornings (or maybe afternoons). They're the ones mixing and topping your Bloody Mary. We’ve power-ranked DC’s craziest ruby-hued concoctions from 7 (that’s a little intense) to 1 (WTF, I’ll try it). 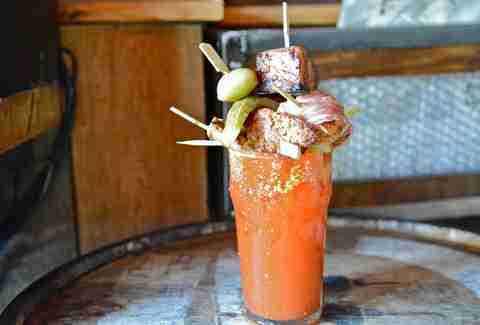 This Bloody Mary boss has an elaborate build-your-own bar that tempts your imagination to run wild. Start by selecting one of 16 liquors, including a few cool infusions, as well as your tomato juice, available in varying spice levels. Then play with adding flavors like wasabi and Sriracha before hitting up the toppings bar that's replete with fresh and pickled veggies, crispy potato strings, cream cheese, smoked bacon, steamed shrimp, herbed goat cheese tomatoes, and... well you get the idea. This decadent dumpling emporium adjacent to the Newseum is best known for their Saturday dim sum brunch. 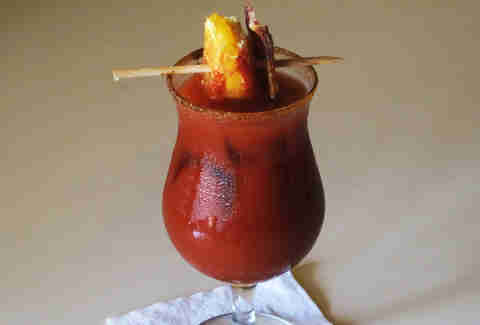 There you’ll find four different Bloodies including two stunners: the Chesapeake and the District. Since we’re at the height of all things crab, the Chesapeake is a solid choice because it’s topped with horseradish panna cotta and a soupspoon of Maryland crab. The District, on the other hand, is ornamented with a cigar-sized half smoke and a black pepper-celery salt rim. Why even order an entrée if this Bloody wears a hat of bacon and a mini grilled cheese? The base is pretty much perfection too, because it contains pickled green tomato juice, regular ole tomato juice, horseradish, Sriracha, Worcestershire sauce, lemon, celery seeds, salt, and pepper. It’s like an afternoon snack from the coolest Mom on the planet. 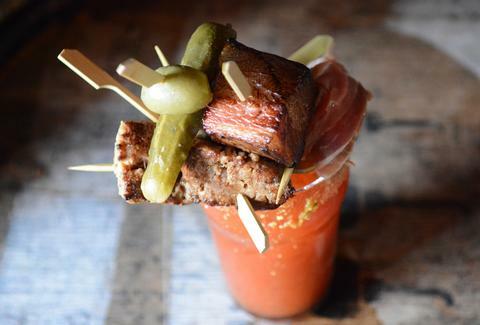 After building your perfect Bloody Mary base (get the Bakon vodka), head to the best part of the Barrel brunch menu. There you’ll find "Step 4 -- Pick Your Meat". The options astound: a Benton ham-wrapped scallop, a bacon brick, an andouille sausage, and finally a fat and juicy roasted poblano and cheese-stuffed sausage. Choose one, or say "turn down for what" and get all four. You also get to pick your hot sauce and salt rimmer. 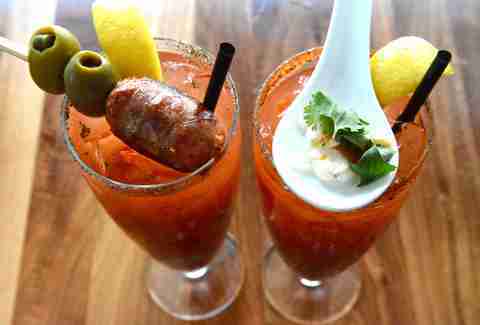 The Bloody at Oyamel proves something can be gross AND good. That’s because it’s rimmed with "sal de gusano". For gringos, that means worm salt. The worms that inhabit the agave plant are dried and then ground down with chilies and sea salt. 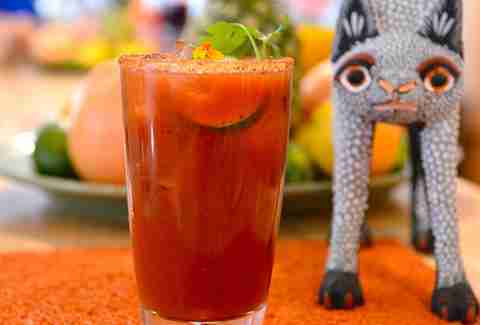 The wormy rim is your gateway to sips of a Bloody made with your pick of mezcal, tequila, or vodka, plus house-made tomato juice, lime juice, and guajillo chili. It’s garnished with cilantro and marigold. 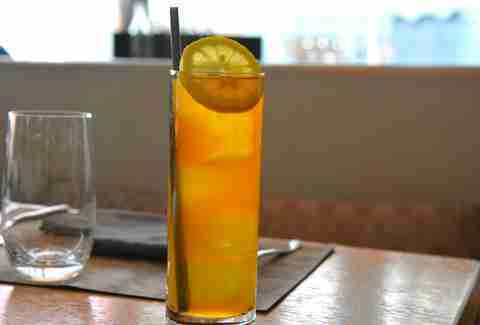 This is NOT iced tea, so don’t ask your waitress to send it back. 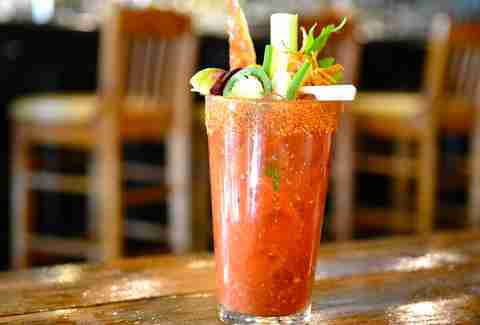 The Bloody Mary at Range by Bryan Voltaggio is a thing of beauty, primarily because it’s made from pig blood consommé. Picture a caldron simmering with bacon, pig blood, and all types of delicious veggies and spices that gets strained and boosted by Tito’s Vodka before making it to your glass. It’s a bit like drinking boozy minestrone, but the bacon and vodka sure do help. Brian Fantana would dig this black beauty because its name, Pantera, means panther. Luckily it doesn't smell like any part of Bigfoot's anatomy. It’s full of Sol de Ica Acholado Pisco, fresh lemon, fish stock (yes, fish stock), red onions, celery, squid ink (yes, squid ink), applewood-smoked tomato juice, horseradish, Worcestershire, fresh pepper, Moldova salt, and grilled rocoto. 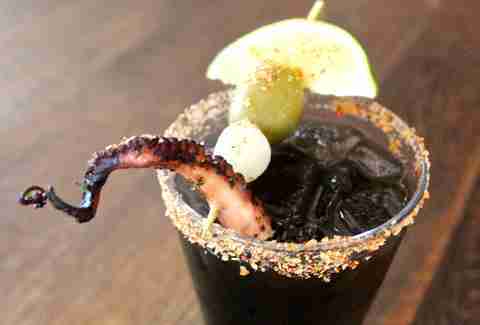 It’s salty, briny, and a Bloody Mary merit badge of sorts, plus you can tickle your brunchmates with the grilled tentacle garnish.